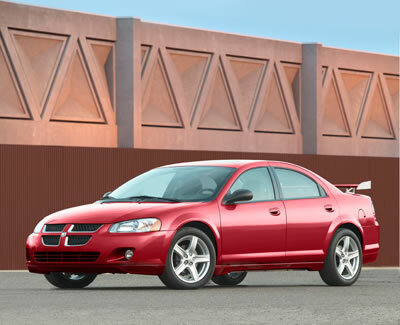 Dodge offers two models of the Stratus Sedan: Stratus SXT and the revitalized Stratus R/T. Stratus SXT is powered by a 2.4-liter, DOHC, 16-valve, four-cylinder engine that produces 150 horsepower and 160 lb.-ft.of torque with a four-speed automatic transaxle. Standard features include air conditioning, tilt-steering column, power windows, power exterior mirrors, power door locks, front and rear floor mats, cloth low-back bucket seats, and remote keyless entry. Stratus R/T sedan is powered by a standard 2.7-liter, DOHC, 24-valve, V6 engine that produces 200 horsepower and 190 lb.-ft. of torque combined with a four-speed automatic transaxle with AutoStick®. Stratus R/T is equipped with a performance suspension with front- and rear-stabilizer bars, and four wheel anti-lock disc brakes.